BELLEVILLE, Ont. (09/06/11) Katherine Phieffer hasn't let cerebral palsy stop her. She graduated from Loyalist College's paralegal program June 9. Photo by Renee Rodgers. 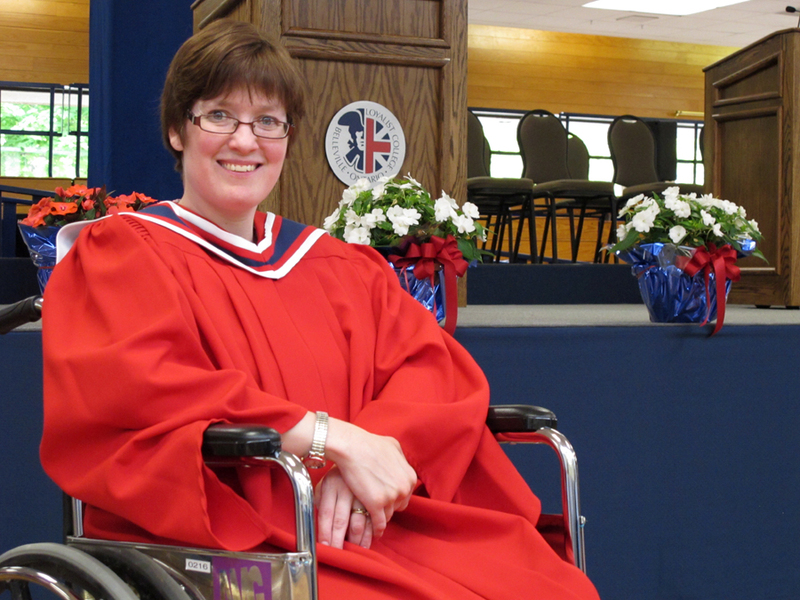 As a mature student with cerebral palsy, Katherine Phieffer faced a few more obstacles in earning her diploma than most students at Loyalist College. Phieffer, who was born with CP, graduated June 9 after completing a two-year paralegal program. She was one of about 2130 students to graduate during the Loyalist College convocation held June 8 and 9. Four ceremonies were given to accommodate the number of grads and their guests. Phieffer, 33, had been working as a debt collector at a call centre in Belleville when the branch of the company she worked for closed. Phieffer was laid off, qualifying her for financial assistance if she chose to return to school. Phieffer hopes to work in the court system as a law clerk or court administrator. Someday she’d like to open her own paralegal firm. The past two years haven’t always easy for Phieffer. Like other students, she wrestled with “hours and hours of homework”. She also faced her own unique set of obstacles on the way to graduation. Getting around the school was sometimes a challenge. “I don’t do stairs on a regular basis,” she said. Phieffer, who uses a scooter or crutches to help her move around, said the fact that the only two elevators in the Kente building exist at opposite ends, meant she needed extra time to travel between classes. “Quite frankly, if you ask me, there should be an elevator in the middle of the school,” she said. There were also times over the past two years when Phieffer felt like she stood out. Of the two classrooms in the Pioneer building with stairs, only one has a ramp. Phieffer said it seemed like every semester her class would be assigned to the room without a ramp, forcing the entire class to move to another room to accommodate her disability. Phieffer kept a sense of humour about the situation, though. “Every semester we had to move, because we got posted to that room,” she said. “I’d say, ‘Yes, it’s my fault we have to move again!’,” she said. Those issues aside, Phieffer said the college provided her with a supportive learning environment. She said the Student Office for Alternative Resources offered several different resources to people with disabilities to make the college experience as hassle-free as possible. The office made an assistant available to Phieffer, who helped her take notes in class. Phieffer said her classmates were always ready to lend a hand as well. Phieffer worked hard to earn her diploma. But on graduation day, she said it was all worthwhile.